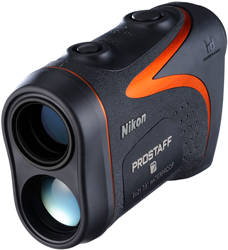 Nikon Vision Co., Ltd., a subsidiary of Nikon Corporation, is pleased to announce the release of the Nikon Laser Rangefinder PROSTAFF 7, an ideal companion for hunting applications. The Laser Rangefinder PROSTAFF 5, introduced in 2012, has been gaining in popularity for its high-speed range-finding in a compact, lightweight design. This new Laser Rangefinder PROSTAFF 7 employs ID Technology, enabling display of horizontal distance, in a sleek ergonomic design with a large, easy-to-view eyepiece and longer eye relief, its high transmittance realising a brighter field of view. According to the subject conditions, Distant Target Priority mode and First Target Priority mode can be easily switched. Distant Target Priority mode is useful when hunting in heavily wooded areas where game animals may be partially obscured by undergrowth or bushes. With First Target Priority mode, the user can measure the distance of the closest subject, ideal for hunting that lone buck in the meadow in front of trees or a fence. Moreover, continuous measurement for up to about 8 seconds is possible by holding down the POWER ON/Measurement button – effective for measurement of the distance to a moving target without worrying about hand movements. LED illumination can also be easily switched ON/OFF manually, to provide you with comfortable range-finding even in dark conditions. The PROSTAFF 7 is the perfect tool for outdoor uses such as hunting. Measurement range: 4.5-550m /5-600 yd. First Target Priority mode displays the distance of the closest subject – useful when hunting for getting an instant reading on that lone buck in the meadow in front of trees or a fence. Distant Target Priority mode displays that of the farthest subject – useful when hunting in heavily wooded areas where game animals may be partially obscured by undergrowth or bushes. Distance measurement display step is 0.1m/yd.